When it comes to investing in commodities, in particular the metals industry, one of the first metals to come to mind as a great investment probably isn’t zinc. Most people don’t brag about locating a new mining company that has a fantastic new zinc mine. No, you’re probably saving that kind of bragging for gold or silver or maybe even lithium. But there’s something happening that most traders aren’t even paying attention to in this metal’s market and it means that many are missing an absolutely amazing opportunity … if you know where to look. Zinc Is Soaring. Are You In? 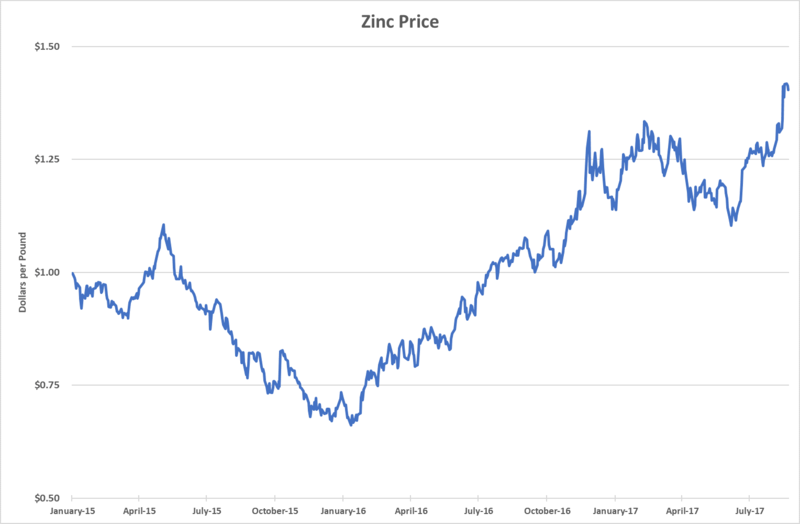 Zinc just hit its highest price since 2007. The recent pullback in the metal’s price proved to be short-lived. As I told you earlier, this little-followed metal is one of my favorite investment ideas for 2017. In 2016, the world used 1.4 million tons of zinc beyond what was supplied by mines. That means we tapped into zinc stored in warehouses. The London Metals Exchange (LME) owns warehouses all over the world that it uses to stores metals. In 2012, there were about 1.25 million metric tons of zinc stored in LME warehouses. Today there is only about 287,000 metric tons. In other words, the world’s massive appetite for zinc is using up the extra supply at a rapid clip. A major global consumer of this critical metal continues to be China. China’s zinc imports soared 353% from February 28 to July 31. July’s volume is well up from the bottom. But it is about 26,000 metric tons below the 2015 peak of 94,434 metric tons. This trend remains in place. If you haven’t bought this metal yet, you can read more about it in my Real Wealth Strategist service and learn how you can still jump on this amazing trend before it is too late. Is This Copper’s Hidden Booster Rocket?